I love to wear skirts. I think they’re so much more comfortable and flattering than jeans or slacks (on my admittedly zaftig shape). I like the way skirts swish around my legs in summer, creating their own breeze when I walk. I like tucking my legs up underneath for warmth when I sit (of course, it has to be the right kind of skirt for this kind of maneuver … a pencil skirt won’t do the trick). 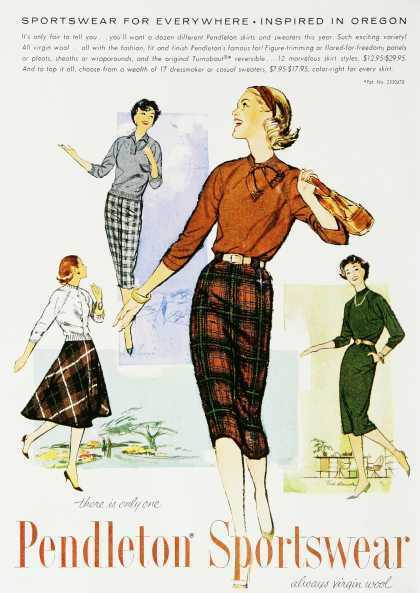 But for a reason I can’t fathom, she goes on to say “a skirt can be worn with a sweater or blouse day in, day out, from one end of the year to the other, almost anywhere at all–except on a city street (unless it is covered by a coat). What? Why would a skirt be considered inappropriate on a city street in 1964? That makes no sense to me. If anyone knows the answer to that puzzling statement, please post it in the comments.